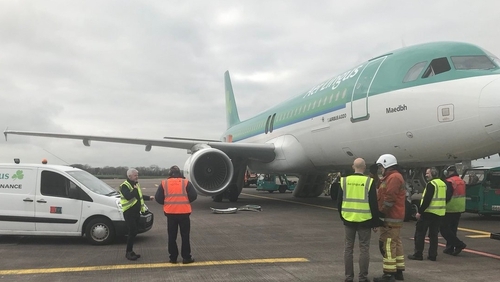 An Aer Lingus flight from Cork to London Heathrow was forced to turn back shortly into its journey after smoke was seen in the cockpit. The flight had been due to depart at 11.50am but was delayed until 12.46pm. Shortly into the flight, the alarm was raised, and it turned back, landing safely at Cork Airport at 13.23pm. The airport was put on full alert, with fire crews and ambulances on standby. There were 151 passengers and crew on board. Passengers had to be evacuated by chute and stairs but there are no reports of any injuries. A full technical investigation of the Airbus 320 is now under way. The Air Accident Unit of the Department of Transport has also been notified. The airline has said the emergency landing was made due to a "technical issue" with the aircraft. A spokesman for Cork Airport would not comment on reports of smoke in the cockpit. Efforts are now being made to transfer or re-schedule flights for passengers.